Join Sr. Systems Engineer, Scott Gelb from Insight Integrated Systems who was recently recognized by NetApp for his contributions to the NetApp community with his knowledge and expertise of NetApp Solutions and Bob Bakh, Solutions Architect Manager as they present new innovations from NetApp. IT is regarded as the single biggest threat to many CIO´s and the only chance to change that pressure is to reduce complexity and find ways to build flexibility and efficiencies into their environments. IT leaders know that yesterday's technology and approaches are Inadequate for today´s business requirements. A constrained economic environment has delayed investments and IT leaders are operating with aging IT infrastructures. Spending that does exist is being spent on maintenance rather than innovation and strategic investments. A perception that is emerging is that IT is old, expensive and slow. That is why a CIO´s biggest threat also represents a huge opportunity. The question is not if they should change but how should they change and how quickly. There´s a new way of thinking about how to build infrastructure that is enabled by server virtualization and amplified by storage virtualization. The new model has many apps sharing the same infrastructure which is highly efficient and highly flexible . It offers compelling reasons to move away from legacy infrastructure and it fundamentally changes the economics of the data center and allows it to be more responsive to the business. There's urgency right now because business success is dependent on the ability of IT to modernize as they make decisions that will impact the long term success of their companies. 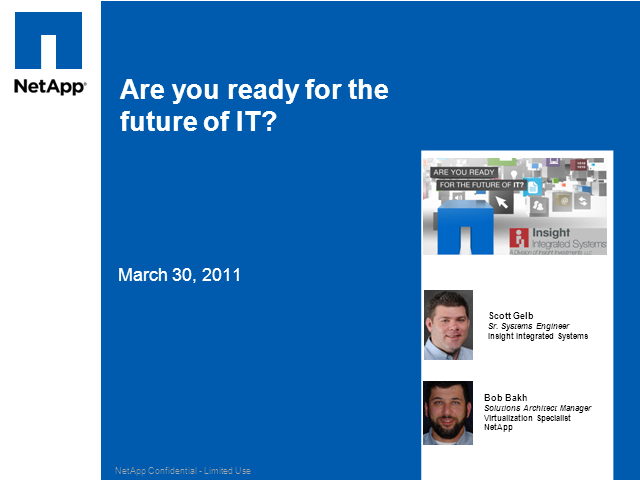 Companies are making the decisions with NetApp to transform their IT. Customers understand that NetApp offers a compelling value proposition and positioned to help them achieve better business outcomes for their business.